What does a Plant need to Survive? Designed for young elementary students to help them examine and understand the needs of plants for growth and survival. 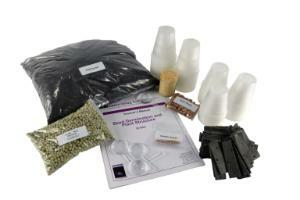 This kit contains materials for 15 groups of two to dissect and germinate seeds, and compare their plant's growth to other types of plants grown in the classroom. Ordering information: Includes 15 Bean Seeds, 15 magnifiers, 15 Toothpicks, 30 Plastic Cups (5oz), 30 Plastic Cups (7oz), 30 Pea Seeds, 30 Sunflower Seeds, 30 Wicks, 1 Bag Soil. Caution: WARNING CHOKING HAZARD SMALL PART. Not for children under 3 yrs.